Are you curious about daith piercings? This article talks about the healing time these piercings take, along with proper aftercare, pain level and potential infections. We’ll also share some photographs with you. The daith piercing area is in the ear, found right above the tragus point. The piercings are fairly similar. This piercing goes through a thick cartilage section, so the piercing does appear more dramatic than many other piercings. In actuality, there isn’t that much pain associated with these piercings, considering the cartilage thickness, and the end look is quite alluring. It takes a bit longer for daith piercings to heal, as compared to other piercings. The area attracts germs and dirt found all around you. The wound is larger than piercings in thinner cartilage, too, so it requires more attention. Keeping it clean is vital. As with other piercings of the ear, you should avoid contact with perfumes, makeup and hair spray. Change your pillow case a few times a week and cleanse your ear after you wear ear muffs or ear buds, or speak on the phone. 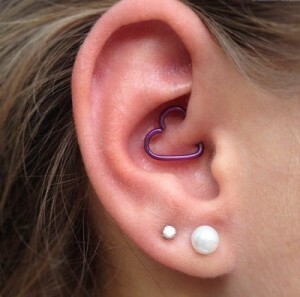 Like other cartilage piercings, the ideal healing time for a daith piercing would be about six weeks. However, people do develop problems during the healing process. These issues make many cartilage piercings take between three and six months to fully heal. Before you decide to pierce your ear with this type, we’ll help to familiarize you with the health risks that come with ear piercings in the cartilage. 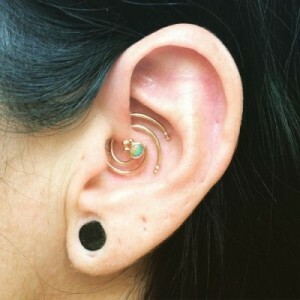 Some people say that all cartilage piercings are quite painful, but others have stated they didn’t have a lot of pain with their daith piercing. There may be a throbbing after your piercer removes the needle, but that pain reduces as daith piercing healing time passes. New piercings can bleed, too, so don’t panic if yours do. Inflammation signs may include perichondritis during the healing process. A red and painful ear is the most common sign of infection in the ear, according to physicians. Pain occurs in the ears’ cartilage portion. The redness will surround the area where the piercing occurred. You may also encounter swelling of the ear lobe, when there is an ear cartilage infection. Dirt may accumulate around new piercings, which can lead to an infection or other potential complications. It’s essential to keep the area around the piercing as clean as you can. Even though new piercings may cause swelling, redness or soreness, seek medical help if you develop a severe infection. If you have irritation around the piercing, and a pus discharge, the jewelry can be rejected. You can have a professional piercer extract the jewelry for you, if you’re worried that the piercing could migrate. Pus can collect in the cartilage and cause infection. It may result in cartilage death. The cartilage receives all its blood from the perichondrium. That could lead to deforming of the ear. An infection left untreated can change the shape of your ear, and can even result in the deformity known as cauliflower ear. Severe infection of the cartilage may cause itching, a seeping discharge and fever. The same infection can even spread to the softer tissues of the neck and face, according to the Medical School at the University of Texas. If you develop any symptoms of cartilage infection, seek medical help right away, to prevent complications in healing. Keloids are puffy, large scars that may form on thin skin, which scars instead of healing. Keloids can appear on the upper ear after a piercing. Laser therapy, cortisone injections and pressure dressings can help to smooth out skin, but it could scar your ear after a cartilage piercing. The ideal jewelry pieces for a daith piercing are captive bead rings. They are comfortable during healing. You can also choose curved barbells, which don’t take up as much room. You can try out larger gauge jewelry, too, but not before the pierced area has healed completely. Jewelry gauge and size requirements are generally determined by your professional piercer. It will depend entirely on the thickness and size of the cartilage. Proper sizing is quite important, especially when you’re dealing with cartilage piercings. The cartilage is easily damaged and that can disfigure your ear permanently if it isn’t done properly. If you want to get a piercing but you’re not sure about which type, there are many options. Some can be done in multiples on the ear, too. The ears are probably the most pierce-able parts of the body. As far as cartilage piercings are concerned, you can choose from tragus and anti-tragus piercings, standard helix and forward piercings, and snug, rook, industrial or daith piercings. There are a number of things that should and should not be done while your piercing is healing, regardless of the type of ear piercing you’ve decided to have done. Your professional piercer can give you guidelines for aftercare, so that you can be faced with only a normal healing time, and not an extended one. By the way, if you’re having any part of the body pierced, you should only go to a professional piercer. If you follow the instructions given to you by your professional piercer and any other guidelines he or she may have, you may expect proper healing for EARLOBE piercings within about four to eight weeks. A daith piercing will take between three months and a year, depending on whether or not you experience any problems before it is completely healed. Soak a ball of cotton in warm water with salt in it. Press it gently against your piercing. Use mild soap for cleaning the jewelry and piercing while you shower or bathe. Dry the area that was pierced gently with a clean paper towel. Don’t allow any accumulation of earwax in your ear canal. Don’t wear ear buds or headphones. Protect your piercing while applying shampoo, perfume or skin lotion. Avoid physical activities that could stress your piercing area. You can use saline solution (aka salt water) to clean your piercing. This is recommended by many professional piercers. Use a paper towel instead of a cotton ball or Q-tip ®. Saturate the paper towel until it’s wet and gently splash and clean the piercing and the area around it. Clean your new piercing two times a day. It’s best not to play with it, other than cleaning. Don’t fiddle with the piercing or the jewelry. Your skin will not become fused to your jewelry if you leave it alone, except for cleaning. While it is wet, you can rotate the jewelry gently, but while it is dry, it could break the scab and cause bleeding. This means an open wound and an invitation to infection. That will make the piercing take longer than usual to heal. Many people believe that once they have their piercing done, that’s the end of it. The healing process will only go normally if you keep the area clean. Even if you keep it very well-cleaned, a daith piercing will take more than the normal amount of time to heal. If you, by nature, are not patient, perhaps piercings are not the proper body art form for you. You may also decide to use a homemade solution with sea salt for your full piercing soaks. You will need sterile water and a top-quality type of sea salt, like Recovery Aftercare Dead Sea Salt. You may add tea tree oil if you desire. If you have sensitive skin, exclude the tea tree oil, as it may irritate the skin around the piercing, which is definitely not what you want to do. When soaking cartilage piercings, saturate cotton balls in your solution first. Apply the cotton balls to your ear piercing one ball at a time until the piercing has been soaked for five minutes or so. If you only have an earlobe piercing, you can even fill a shot glass or other container of that approximate size with a solution of sea salt and water and hold it on the earlobe. The whole earlobe can soak in it for the five minutes, in lieu of using cotton balls. Making up large batches of your sea salt solution is helpful, so that you can do your soaking two times a day without it taking a lot of time. Store it in a container that seals securely so you can use it whenever you need it. Be very careful as you brush your hair and wash daily. A brush or even a hand hitting the ear can traumatize your piercing. Don’t play with your jewelry or let anyone else touch your piercings. If you NEED to touch your piercing or jewelry, make sure you have cleaned, gloved hands. DON’T turn, slide or twist your earring when you are breaking up “crusties”. You could force bacteria into your piercing or fistula, causing infection. Alcohol, excess caffeine and aspirin can thin your blood, so don’t use any of these on your piercing day. New piercings may bleed occasionally in the first days, so avoid these medications or drinks for the first few days after you get a new piercing. If you are on non-steroidal anti-inflammatory drugs (NSAIDs) for pain or swelling, you can use acetaminophen rather than ibuprofen or aspirin. Ibuprofen isn’t a natural blood thinner, but it may cause excess bruising. Some soap can be harmful to daith piercing healing, since it dries out your skin and increases your risk of infection. In addition, hair gel, sprays and other products for your hair, along with balms, creams and oils, can hinder the healing process of your piercing. Bacteria is literally everywhere. You cannot totally avoid it when your piercing is healing. However, you can make your chances smaller of developing infection by avoiding swimming pools, hot tubs and lakes. You should also not allow people to touch your piercing, and only touch it yourself with clean hands when you need to clean it. When you have an EARLOBE pierced, it’s OK to change out your earring by yourself after about eight weeks. However, with cartilage piercings, you need to wait between six and twelve MONTHS before you attempt to change out the jewelry. The longer time you give your piercing before changing jewelry, the better your piercing will progress and heal. It may be difficult to change your earring the first time, so you may opt to visit your piercer and have him or her do it for you, after the proper time has passed. I had my daith piercing done about a month ago. Yesterday I noticed bumps have come up on both sides where the ring goes into my ear. It sounds like this is a common occurrence but I’m still not sure what to do about it. Should I see my doctor? This symptom may be in a response to an infection. It would be beneficial for you to remove the piercing and allow your ear to heal. Perhaps speak with the person who pierced your ear. You can always get it pierced again. Please share your experiences and insights in the future. Best of luck, Brenda! Well, I am not a big piercing buff, however my ears are pierced and having suffered with migraines for the last 4 decades, I decided to try a daith piercing at the recommendation of the Nurse Practitioners I work with. I had been waiting to have it done with my daughter, but after having weekly weekend migraines that have been progressively getting worse, I decided to have it done 1st in my left ear 3 weeks ago at a shop that does tatoos and piercings at the mall. My migraines improved but continued so decided to have the right one done by another piercing professional, this one actually measured the acupuncture site, taught me how to manipulate the earring, taught me the care, etc. And for me, Linda, the piercing professional, changed out the barbell that was placed in the left piercing with a titanium earring that I had wanted initially. I do not have any trouble with my stethoscope, the barbell I found much more annoying. Definite better experience at the latter business and healing has been better as well. I have what I assume is a piercing bump on the left piercing and am going to use the tips listed in the online article to try and alleviate the symptoms or allow it to close. I would recommend that you do research before you have the piercing done. 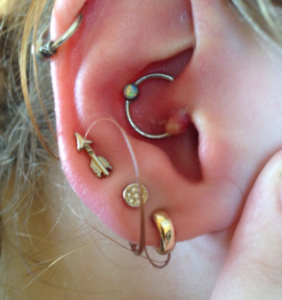 Ask healthcare providers; a lot seem to know about acupuncture and daith piercings. A nurse practitioner is who recommended Linda for my second piercing. Thank you for sharing your experiences and insights. 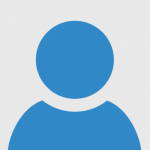 You certainly will support member of our community with your supportive comment. Please share more of your thoughts and feelings in the future. Have a great day, Colleen! Thank you for sharing your informative comment. We always appreciate when members of our community share their insights and experiences. It is certain that someone will find great benefit by reading your experience. Have a great day, Sally! I have a bump on both sides of the piercing is that normal? It is possible for there to be bumps on both sides of your nose. You may want to remove the piercing to give it time to heal. Perhaps speak with the person who pierced your nose about your experiences. They may be able to give you the advice you are seeking. Have a great day, Martha! I got my daith pierced by a professional 2 days ago. It is just now feeling sore and looks a little swollen. Is this normal? It is normal for a piercing to be swollen. Continue to monitor your piercing. You may find benefit in speaking with the person who pierced your ear. They may be able to give you advice. Have a great day, Lucca! I just got my daith piercing within the last 24 hours. The piercer had some trouble getting it through my ear and I’ve been experiencing some soreness. I’ve washed it with mild, antibacterial soap, and cleared it with some saline solution (warm water and sea salt) is swelling normal within the first few days? Continue to monitor your experiences. 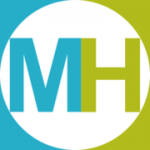 Healing times may be different for different people. If it gets worse over the next few days, then remove it and allow your ear to heal. You can always get it pierced again. Continue to wash it and use whatever you feel comfortable using. An antibacterial would work best. Have a great day, D’Mari! I had a daith piercing done in January and I faithfully cleaned it twice a day for the first four months. It was doing so well that I thought it was healed and backed off on the cleaning regime. I ended up with an infection that went away with sea salt compresses. Now at 6 months, I am still cleaning it, and it is no longer red, swollen. 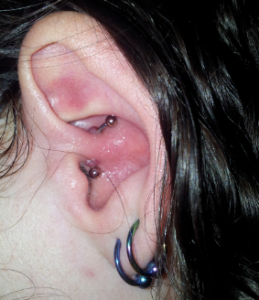 However, the ear/cartilage has been very sore and tender. I am thinking about removing the jewelry and letting the piercing heal up. My question is – do I need to be concerned about removing the jewelry and “trapping” an infection in my ear? Or does the body naturally heal up anything after the jewelry is removed? It would be beneficial for you to remove the piercing and allow your body to heal. Your body will be able to heal better with it removed. Your body will not trap the infection. The infection will be more easily fought were you to remove it. Best of luck, Renee! It is possible that you have an infection. Continue to monitor your symptoms at this time. If you find that you would be benefited by speaking with a medical professional, then make an appointment. If your symptoms improve, then continue to monitor it. Best of luck, Lakisha! My piercing has a reb bump next to it and the scab keep comming of after it gets wet.. Is it infected? Should i have it removed? It is possible that you are experiencing an infection. Continue to monitor your experiences at this time. If you find that the pain continues or swelling increases, then remove your piercing. It is better to care for your potential infection than to keep your piercing in. Best of luck, Lila! I had my daith pierced over a year ago and had my jewelry changed out 3 days ago. I went to my piercer and had it changed out. It’s only been 3 days but my piercing is very tender. Is that normal? I purchased the jewelry from my piercer so it isn’t just a random piece from the internet. It’s quality stuff. I’ve been keeping it clean and my hands off of it. Maybe I’m just paranoid because it is my favorite piercing and I don’t want to have to take the earring out. I dang sure don’t want to have to get it re pierced later! That hurt so bad!! But it was worth it! Continue to monitor the experiences that you are having. If it remains tender for another week, then speak with your piercer about your concerns. If you becomes inflamed or infected, then take out your piercing. It is better to be safe than sorry. Even though it is not always pleasant, you can always get a piercing done a second time. Best of luck, Cat! I had my piercing done about 2-3 weeks ago and i am having less and less crusties on the piercing. Is it possible for it to heal really really quick? I once had a normal piercing done and it healed faster than average so I was wondering if it was going to be the same for my cartilage daith piercing. Everyone heals at a different speed. Different parts of the body may heal at different speeds as well. Continue to monitor the experiences that you are having at this time. As long as it continues to heal, you have nothing to worry about. Have a great day, Baylee! I had a daith piercing done 1 week ago. My ear feels swollen and is painful to the touch.I have been keeping it clean.What can i do, short of removing the piercing, to make it feel better? Your best option is to continue to attempt to keep it clean. Give it a few more days of cleaning and care. If you find that you are still experiencing unpleasant sensations at that time, then it would be wise of you to remove the piercing. Have a great day, Michelle! Is there a piercing that will help dizziness, nausea or feelings of unsteadiness? Piercings do not actually help with dizziness or nausea. Some people do eat ginger to help with nausea. Instead of resorting to a piercing, it may be a good idea to go to your doctor to get checked out and find out the cause of your symptoms. Certain conditions like anemia can cause some of these symptoms, and many have medical treatments available. My piercing has a red bump next to it the scab keeps comming off everytime it gets wet is it infected? Should i get it removed ?